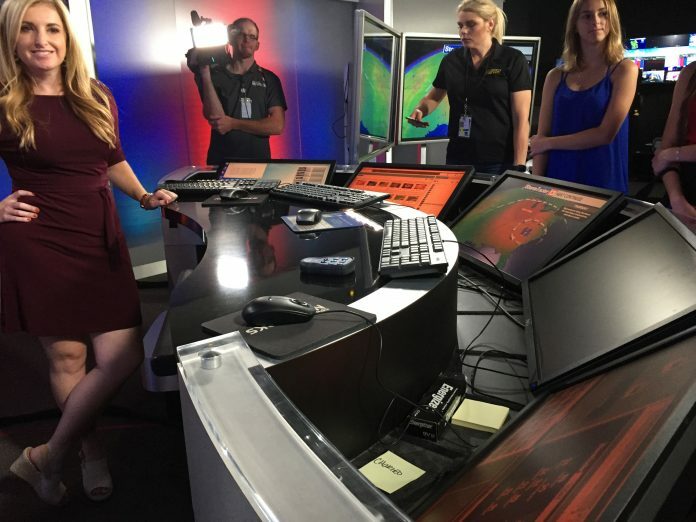 UCF students got a chance to see for themselves what it’s like to be a meteorologist and watched a live weather cast by Spectrum News 13’s Mallory Nicholls. Five student journalists and meteorologists from the College of Sciences toured the Spectrum News 13 newsroom and weather center, Sept. 20, at an event for aspiring women meteorologists. Students were given the chance to try out the green screen and give a mock weather report. “It’s an exciting profession and a lot of fun,” News Director Susan D’Astoli said. Meteorologists Nicholls and Maureen McCann explained what their day is like and the tasks they must do. “You’re taking complex scientific information and then you’re breaking it down to what the viewers want to know,” McCann said. The meteorologists’ work involves much more than just presenting the weather. They must work on graphics, make their own forecasts and write the script for closed captioning, Nicholls said. Not all the students present were journalism majors. Priscilla Samayoa, engineering and math double major, said she was interested in meteorology. “I was thinking about doing something more behind the scenes because I’m super camera shy,” Samayoa said. The experience was exciting especially for students who have never been in a newsroom before. “It’s definitely super interesting to me and I’m more intrigued about it,” Samayoa said. Part of the weather cast is pre-recorded in a normal day, but when there’s a major weather event, meteorologists are live and constantly updating, Nicholls said. McCann and Nicholls talked about their challenges and struggles to get to the successful career they have now. Both had to start in smaller markets before coming to Orlando. McCann said she can relate to UCF students because she is a fellow student. She is currently working on her master’s degree in emergency and crisis management at UCF. Spectrum News 13 offers internship opportunities for students. “We actually put [interns] to work,” Nicholls said.